These are my unofficial draft versions of character sheets for Rattrap’s .45 Adventure 2nd Edition; they use a vaguely period typewriter font for a somewhat pulpish look, and while the layout is still a work in progress they take up less space than the 1st Edition sheets. 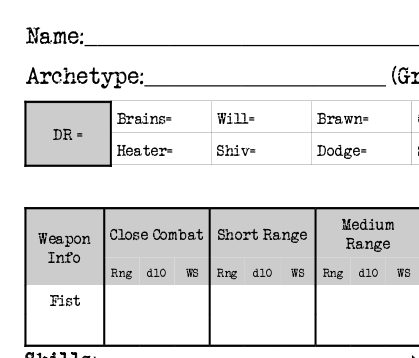 Part of the Grade One character sheet. The PDF is 3 pages; there’s two Grade 3 & 2 characters per page and six Grade 1 spots. Download the PDF right here (73Kb). Feedback, suggestions or comments below in the comments area, as always! 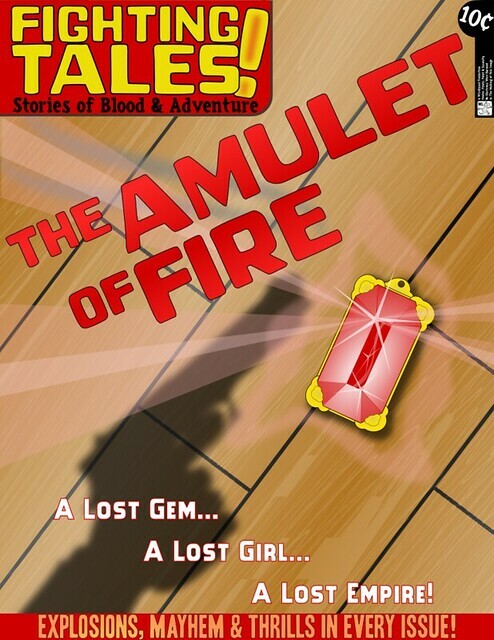 Another review of .45 Adventures 2nd Edition has come out, this one in The Ancible #9, a free-to-download PDF magazine. I hadn’t actually grabbed a copy of The Ancible before, I have to admit. It started as a “real” paper magazine, I’m pretty sure, and when it switched to free PDFs I missed the memo! It bills itself as “a full colour digital magazine that specilises in the field of Science Fiction and fantasy wargaming” and it delivers — besides the 45A2e review in this edition there’s a long review & painting article on some giant Warmachine war wagon, a review of the new Battletech box set, another review of Heavy Gear: Arena, some interviews (great conversions in the interview with the Frenchwoman!) and a lot of advertising for all sorts of conventions, companies and such. Well worth checking out, I shall have to start grabbing the back issues and seeing what I missed. 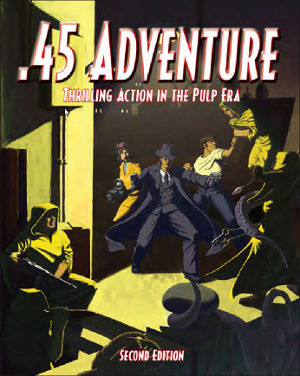 The 45A2e review is longer than mine, with a nice introduction to the pulp gaming genre and more detail on specific game mechanics and such than mine. Go check it out, and the rest of The Ancible. Well worth it. Rattrap Productions released the much-anticipated 2nd Edition of their .45 Adventures pulp adventure rules a few weeks ago, I received my copy of the full rules last week, and I’ve already run one convention game and several small private test games with the demo rules before even getting the full rules. This review is mostly aimed at folks who have some familiarity with the 1st Edition of 45A, but it should be general enough to give those of you with no experience at all with the system an idea of how it works. Note that throughout this review I’ve used “45A1e” and “45A2e” for 1st & 2nd Edition respectively; this is a bit of a D&D-ism but useful shorthand! 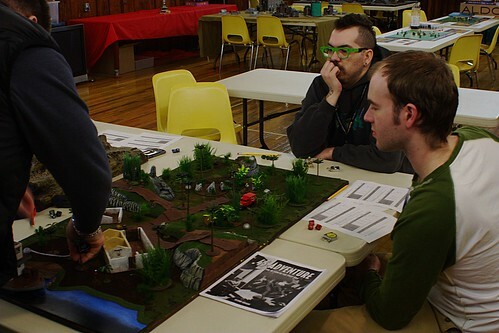 I have finally got the pictures from the Amulet of Fire game at Dak’Kon. This is the second time the game has been run (the first was GottaCon in February, the third will be this weekend at Trumpeter Salute) and the last time we will likely run .45 Adventures 1st edition. The con itself was great and I have also posted some images from the Savage Worlds Tournament in another flickr set. [R]attrap Productions has just released the demo PDF of .45 Adventures 2nd Edition! There’s a 22 page set of demo rules which include the full movement, combat, wound, vehicle, explosive and flying rules, as well as enough Archetypes to build some characters and teams to test the new shiny out. There’s also a draft copy of the 2nd Edition Special Abilities PDF, with a good selection of the skills & special abilities that’ll be available in 2nd Ed. More later perhaps when I’ve had a chance to look it over properly and build a character or two! Short version is that I like what I see, lots of streamlining and good tweaks to an already great system. Full release of the rules is pencilled in for mid-March, apparently. After running last year’s .45 Adventures convention scenario at least six times, it was time to retire it. Few things worse than a bored gamemaster, trust me. The rest of the scenario should be finished, first draft at least, this weekend, then it’s a playtest and on to it’s first public showing at GottaCon 2011, 4-6 Feb. Some graphics inspired by interwar pulp magazine covers. Done in Inkscape primarily, with some of the photos manipulated first in GIMP. Some links of interest to pulp wargamers. An ongoing project; I’ll bump it back to the top of the posts when it gets updated and expanded! Rattrap Production’s .45 Adventures has an excellent supplement called “Valley of the Thunder Lizard”, filled with dinosaurs, dino-men, Neanderthals and other Lost World fodder. It’s definitely my favourite 45A supplement, and it sees a lot of use in our 45A games.